Well, can't argue with the numbers. to review the Fire Ants. I'd like to see giant ants in the canon and these seem like a simple and effective way to achieve that. Xualtiacan Fire Ants by Scytale has received 5 Yeas (Super Bogue, vegietarian18, capsocrates, nyys, hivelord) for review and moves onto to unified fanscape evaluation. Last edited by vegietarian18; July 18th, 2013 at 12:46 AM. I'd like to re-nominate my Pavin Nahz custom for SoV. Here is my old submission if you'd like to read it, only a little has changed since then. There is an 8-space clear sight limit on Cover Shot Special Attack movement, and only small, medium, and large (non-flying Unique Heroes) can benefit. The non-flying restriction is so Pavin doesn't boost Raelin & Marcu, who loved an older version of this power. He's on the weaker end competitively, but is fun to play with groups of Unique/Uncommon heroes. He's not a unit I'd take to a normal tournament, because you have to build an army around him to get the most benefit from Pavin, and an army with so many Unique Heroes (that aren't dragons) just can't deal with most squad-heavy builds out there. Movement is only so valuable in heroscape, and you're basically sacrificing an attack to move your allies. The miniature used is the Star Wars Chiss Mercenary from Imperial Entanglements. abprices shows 23 in stock. Alterealitygames has 90 in stock costing only a quarter. That's a total of 113 miniatures after minimal searching. 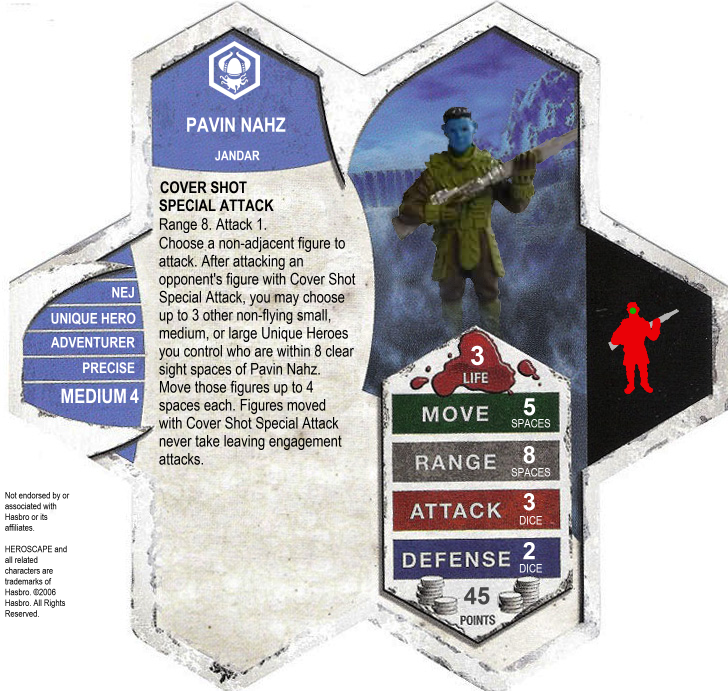 Pavin Nahz is a Medium 4 figure, about the same size as the Mariedians and D&D humanoids. Comments in my customs thread have been positive regarding the miniature choice. Here are a couple pics. I liked him before, and I still do. I like everything about Pavin Nahz but the Unique Hero restriction. Partly because it's an arbitrary and unnecessary restriction, but maybe more importantly because it acts as if "Small, Medium, or Large Unique Heroes" is a category of synergy, and I don't think it should be considered one. Move-other-figure powers either move all figures (like Summoning), with maybe a size restriction, (like Carry) or they move some thematic subset of figures ("Tricky Vydar," "Jandar Squad," etc.) but "Such and such size Unique Heroes" is not a thematic subset. In fact, this extends beyond move-other-figure powers. There are no powers that reference Unique Heroes specifically unless those powers are either singling out Unique Heroes as being tougher to auto-wound or auto-kill (like the Black Wyrmlings or Braxas) or referencing mechanics that belong distinctly to Unique Heroes (like powers that reference wound markers). Actually, the tougher-to-kill mechanics (Chomp and PAB) single out heroes, not unique heroes. Personally, I worry a lot about making such a broad movement bonding power. The bizarre TKN synergy has been removed by restricting to S/M/L, but this speaks to the way this power would need to be kept in mind when designing all sorts of figures in the future. Can Theracus carry on a cover shot move? Yeah, he opens up so many corner cases and will limit new possible powers in the future. I really wouldn't like that. Not really. The only troublesome issues are because of "before moving", or "at any point while moving". For all future units, simply add "normally" after that phrase, and there is no synergy. Pavin can't move fliers, and Brunak is huge, so we can FAQ it if the issue comes up due to a future unit. EDIT- Actually, due to Saylind's FAQ, the answer is no. When Saylind uses her Spear of Summoning to move a figure with a special power like Carry that says “Before moving”, can that power on the moved card take effect? Last edited by Arch-vile; July 18th, 2013 at 07:03 PM. I think there might be even more exceptions than just Brandis, dok, but I was mainly focusing on powers that would be categorized as "synergy" and not necessarily weaknesses or strengths against opponent's figures. In the synergies category I really don't know of any other powers that affect Unique Heroes that aren't related to the mechanics of unique heroes. Can any forum member vote for review? Or just select folks? If I could, to review Pavin Nahz. Life is short, make a deep impact before you leave. The only question at the end of the day is - Was the world a better place for having had you?